A few economists are saying that we will soon have a second recession. 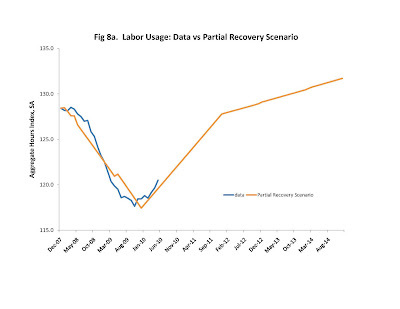 Although I expect the labor market recovery will take years, it will be a recovery nonetheless. Double-dip recessions have occurred in the past. The severe 1981-2 recession began only a year after the 1980 recession ended. The Great Depression of the 1930s also came in two phases: 1929-33 and 1937-8. The first phase of this recession seemed to end in 2009, when real gross domestic product and employment stopped falling in the second half of the year. It is certainly possible that in 2010 we will see a quarter in which real G.D.P. falls a bit. Measured G.D.P. increased so sharply at the end of 2009, with hardly any improvement in the labor market, that economists have been suspicious that real G.D.P. was overstated. National employment will be lower this month than it was in May, largely because many employees are finished working on the 2010 Census. But a small one-time drop in G.D.P. or layoffs at the Census Bureau should not be confused with a new recession, let alone a return to the economic deterioration we experienced after the summer of 2008. When Lehman Brothers failed in September 2008, the United States labor market was about to get a lot worse – national employment would subsequently fall about seven million over the next year or so. But a number of indicators were already looking bad by September 2008: real private consumption spending had fallen 3 percent since the end of 2007, real spending on consumer durables had fallen 13 percent, the stock market had fallen more than 20 percent (adjusted for inflation) and housing prices had fallen more than 15 percent. 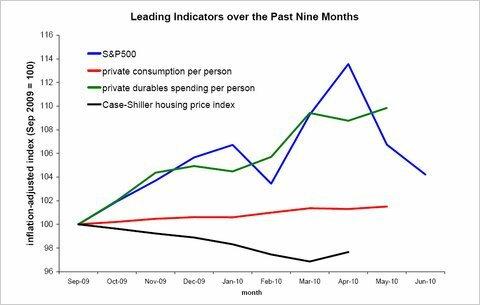 The chart below shows that the past nine months have been different: real private consumption has risen, with spending on consumer durables up almost 10 percent. The stock market is down over the past couple of months but still higher than it was last fall. Inflation-adjusted housing prices are down a bit: 2 percent, according to the Case-Shiller Index. Based on factors like these, I predict that seasonally adjusted national employment and work hours will be a couple of percentage points higher at the end of 2010 than they are now: that is, we will be weakly recovering from the first recession, not starting a new one. Banks are often ridiculed for making home loans in the mid 2000s, when supposedly they should have known that housing prices would fall. But banks were in a "heads: I keep all the winnings, and tails: I share the losses with taxpayers" situation, and it was rational to downweight the probability that housing prices would fall. This article quantifies some of the taxpayer help mortgage market participants expected in the contingency that housing prices fell. Some information about that trend in this article. The persons receiving the credit previously lived in dwellings that are not substitutes for owner occupied homes. Of the 1,000,000 who supposedly bought homes because of the credit, some of them would have been induced to buy with a much smaller credit (say, $100) and others needed the entire credit. Note that housing prices had to go up LESS than $7000 because the price increase would have just canceled the credit and nobody would have been induced to buy. $3500 is a good guess for the price increase (given the assumptions above), and would be exactly right if marginal potential new buyers were uniformly distributed in terms of their willingness to pay. The average home in 2009 sold for $217,000, of which $3500 would be 1.6 percent. 1.6 percent is still less than the housing price increase reported by Case-Shiller over the most recent twelve months. So, even if a 1.6 percent impact were not exaggerated, housing prices would have been stable or increasing over the past year even without the credit. Moreover, the 1.6 percent impact is exaggerated. First, homes were sold to buyers who did not get the credit, and those buyers did not compete directly with buyers who did (for example, vacation homes or larger homes that are typically sold to buyers who already own a home). Those homes count in the housing price index, and had a price impact of much less than $3500. Second, owner-occupied homes are not in fixed supply -- indeed much of the construction activity over the past year has been attributed to the credit (this is an exaggeration too). 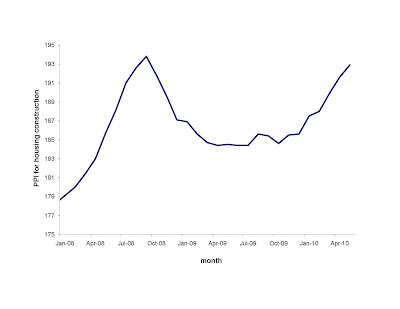 To the degree that the supply of homes was impacted by the credit, housing prices increased less than $3500. Third, the persons receiving the credit were living somewhere before they purchased their credit-eligible house. Their former dwelling is on market, pushing down housing prices. One back-of-the-envelope way to consider all of these effects is that each cuts the price impact in half, so that the price impact is $438 ($3500/8) or 0.2 percent. In this case, the main effect of the credit was to cause a few new houses to be built and a couple of million families to switch swap residences with each other. Regardless of whether the price impact was $400 or $4000, the fact is that housing prices and construction activity stopped falling a year ago, and it is a wild exaggeration to claim that the pattern would have been much different without the new home buyer tax credit. Fannie Mae will now penalize some of the borrowers who walk away from their mortgages. Penalizing delinquent borrowers can help the foreclosure crisis, but giving a free pass to those with low incomes will increase the supply of low income people. Economists disagree about the prospects for inflation. But inflation may be something to welcome, not fear. Prices in the economy ultimately depend on the demand for goods relative to the demand for dollars and related assets (such as Treasury securities) whose values are specified in dollars. Prices in the economy increase – that is, there is inflation – when demand for goods increases more than demand for dollars and related assets. Economists agree that the deflation of 2008-9 – when prices fell in the economy – resulted from a “flight to quality,” a rather sudden reduction in demand for goods and increase in demand for dollars. They agree that, in principle, inflation will occur in the future if demand suddenly shifts in the opposite direction. But there is a lot of debate as to what will happen to the relative demand for goods, and therefore disagreement about the future of inflation. Some economists say investors over the next several years will continue to demand dollars, so future deflation is the more likely danger. Continued glimpses of deflation – such as the fall in the consumer price index from April to May 2010 – give some support to that view. Other economists, including John Cochrane of the University of Chicago in this recent paper, say our government budget is on an unsustainable path, with lots of public spending promised and elected officials who lack the political will to raise taxes. The Treasury, they say, will make ends meet by flooding the market with Treasury securities, thereby causing inflation. Clearly our government has promised a lot of public medical care, as well as much spending on pensions both for future Social Security recipients and for retired public employees. Few elected officials want to crusade for higher taxes. But our aging population and public medical spending that grows faster than the rest of the economy are nothing new to 2010. History certainly has examples of high inflation that resulted from dire fiscal situations. But there are also many examples of governments that fueled new spending programs by raising taxes or by cutting other spending. Our government may well raise taxes, cut military spending or cut spending on certain types of health care. So the real question is whether the economic damage from inflation is more or less than the economic damage of raising payroll taxes, implementing a national sales tax or paring some of the government’s spending promises. The answer is that inflation is less costly now than it usually is. Inflation would alleviate some damage done by the housing market to the wider economy. Specifically, inflation would raise prices of homes, among other things. Higher housing prices would pull a number of mortgages out from under water – the case when more is owed on a mortgage than the market value of the house that collateralizes it – and thereby reduce the number of foreclosures. So even if our government had its fiscal house in order, the reason to expect inflation is that inflation wouldn’t be so bad right now. The public debt has accumulated throughout the recession as federal revenue collections declined. But the recent rebound of personal income tax collections may also be bad news for future generations. 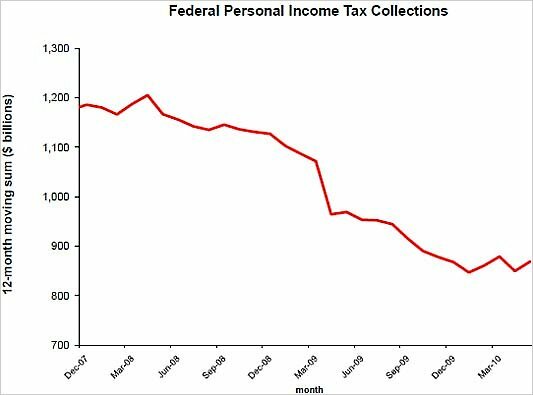 The chart below displays amounts collected by the federal personal income tax since the beginning of the recession (to adjust for seasonality, the chart shows the sum over the previous 12 months). Before the recession began, it was almost $1.2 trillion, but it fell to as low as $847 billion this year. Through May 2010, the federal income tax had collected $869 billion over 12 months. One policy change tending to increase 2010 federal income tax collections is the one-time opportunity in 2010 for anyone to convert a conventional individual retirement account, in which taxes are deferred until money is withdrawn, into a Roth IRA, where investment gains are tax-free (before, conversions were limited to only people who made less than $100,000 a year). A conversion presents younger taxpayers with a large income tax bill now, which in many cases is offset by income tax savings they will enjoy in retirement. Thus, as taxpayers take advantage of the opportunity to convert, the Treasury will see an income tax bump, but this bump comes at the cost of revenue in the future, when those taxpayers would have been liable for income taxes on their retirement incomes. 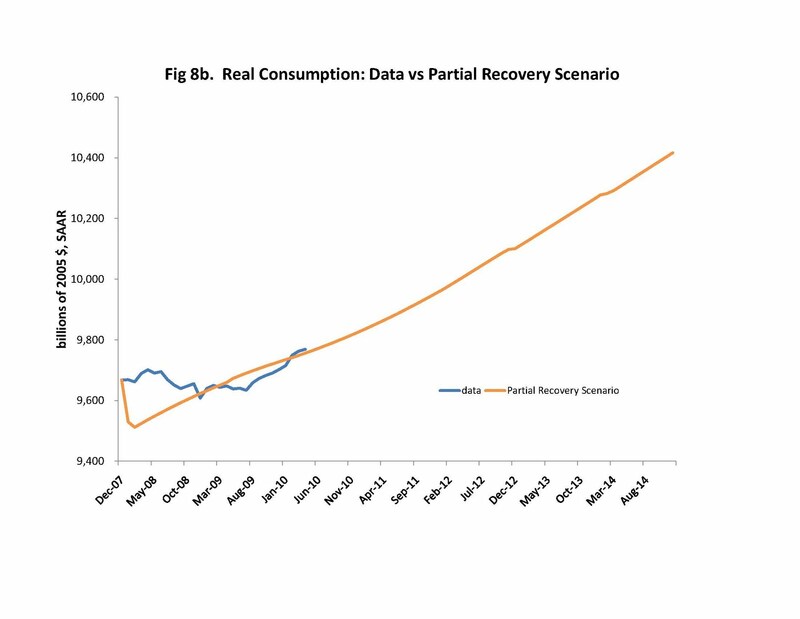 The conversion opportunity is a lot like government debt itself: it presents the government with more revenue to spend now, and less revenue to spend in the future. The housing boom and bust left us with a sea of foreclosures and other economic troubles. Higher interest rates might have toned down the housing cycle but would have created other problems. Houses may be the ultimate long-term investment. They last a long time — some houses are around for more than a century — and most last longer than the people who built and first lived in them. So the value of a house depends not only on how it will be used when it is first constructed, but also on the present value of its uses 20, 50 and even 100 years later. The longevity of homes is the reason why interest rates, especially long-term rates, are an important feature of the housing market. The lower our long-term interest rates, the more weight the market puts on value created in the distant future, and the more houses are worth. Housing certainly would have boomed less in the 2000s — prices would have been lower and housing construction would have been less — if interest rates had been higher. But economists take this conclusion too far when they blame a large fraction of the housing boom on low interest rates. There are plenty of long-lived assets aside from owner-occupied houses, and interest rates also matter in determining their values. The Empire State Building, for example, is still generating significant rental incomes for its owners 80 years after its construction began. And many apartment buildings date from that time. 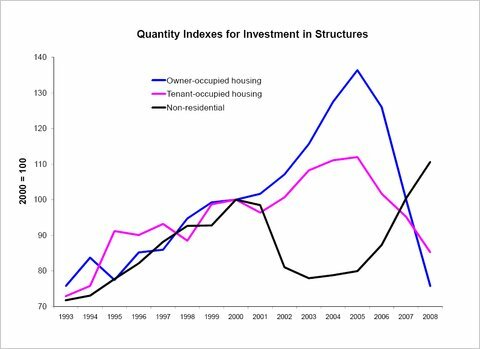 The chart below shows how the boom in housing construction was actually a bust in the building of nonresidential structures, and less of a boom in the building of apartments, even though the values of all three types of structures are affected by interest rates. The series in the chart (from this paper and based on measurements by the Bureau of Economic Analysis) are indexes of construction activity for three types of structures: Owner-occupied housing, tenant-occupied housing (typically apartments) and nonresidential structures. An index value of, say, 110 means that construction activity was 10 percent greater than it was in the year 2000. All three series increased before the year 2000, in part because the population and the economy were growing. Some measures of interest rates were low in the early 2000s, and that’s when housing construction boomed. But the construction of apartments boomed much less, and the construction of nonresidential structures was actually low — below 90 — through 2007. Thus, the major factors in the housing boom were something other than low interest rates and are much debated (Paul Krugman and Raghu Rajan recently debated the role of home loan lending standards, and I have written about the role of technical change). 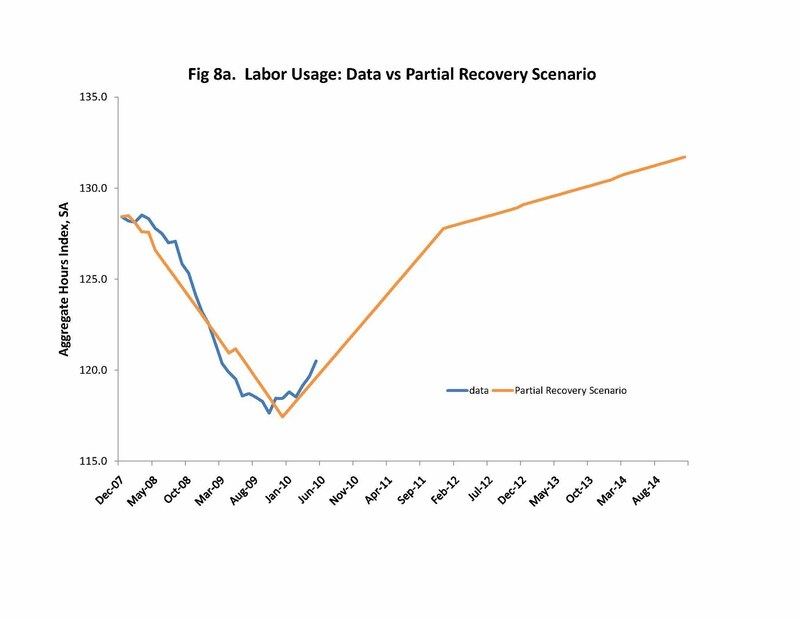 Had the Federal Reserve been able and willing to raise long-term interest rates in the early 2000s, that might have softened the housing cycle but would have worsened a shortage of business capital on which many of our jobs depend. Updates including consumption through April 2010 and labor usage through May 2010. Government deficits have stabilized in recent months, and so has private savings. It is likely that the private sector dampens the effects of government borrowing. By definition, the government runs a deficit when its spending exceeds its revenue. It typically finances the difference by borrowing. Of course, future governments are burdened with paying the principal and interest on the government debt created today, which is why many critics of deficit spending conclude that such deficits leave us worse off in the future. Before the recession, which officially began at the end of 2007, the amount of government dissaving (combined for federal, state and local governments) was about zero. Thanks in large part to federal government actions, quarterly public dissaving increased to $400 per person in the first two quarters of the recession and by an additional $400 per person in the first two quarters of 2009. 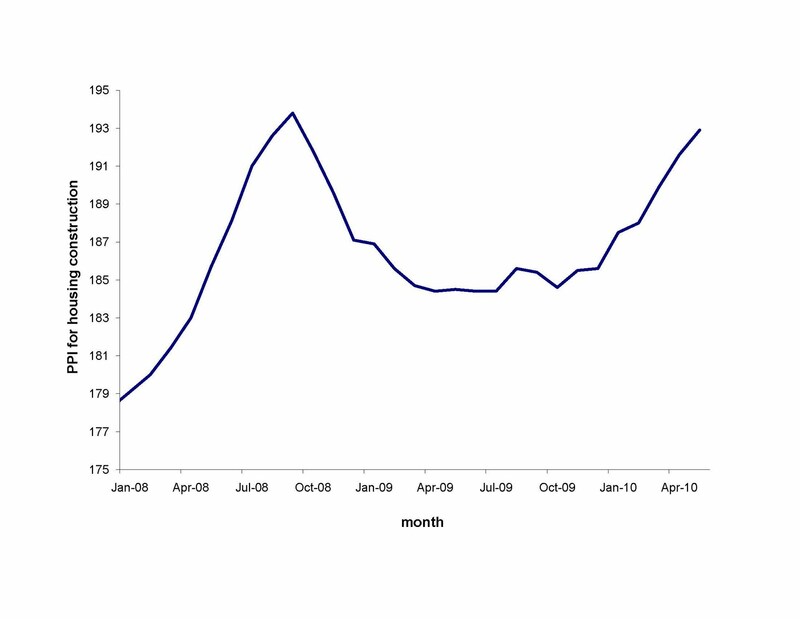 Since then, public dissaving has stabilized at $700 to $800 per person. savings. To the degree that private saving offsets public dissaving, public dissaving leaves no negative legacy. 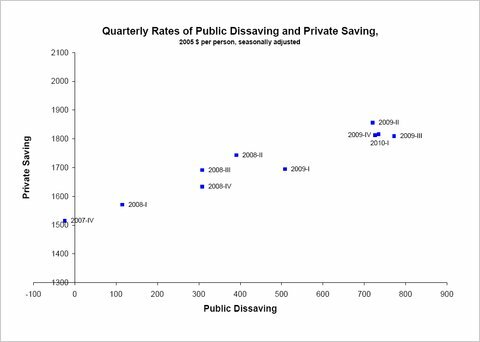 The chart below graphs public dissaving versus private saving, both measured by the Bureau of Economic Analysis and expressed in inflation-adjusted dollars per person for each of the 10 quarters since the end of 2007. The more recent points are furthest to the right in the chart, because of the historically large government deficits. But they are also at the top of the chart, because the private savings rate has been unusually high. In fact, the chart shows a strong positive correlation between the amount of public dissaving and the amount of private savings. 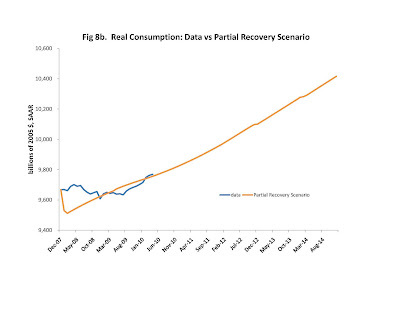 Earlier this year, I blogged about Prof. Robert Barro’s theory that the private sector responds to public borrowing by saving, because the private sector anticipates that its taxes will be higher in the future in order to service today’s public debt. Readers, and many economists, were dubious that private savers think about future taxes or give them much importance in their saving decisions. But the association of more public dissaving with more private saving continues to be confirmed with data from recent quarters, so that correlation needs to be explained. I also pointed out that the private sector seems to love government debt, as evidenced by the fact that government debt sells in the marketplace for such high prices (that is, investors accept such low rates of interest when the federal government borrows). Thus, another possible explanation for the pattern shown in the chart is that a surge in private saving pushes down government bond yields and encourages the government to borrow more. A related explanation is that both the private and public sectors are reacting to the recession, with the public sector borrowing and the private sector saving. That the private sector would save, rather than borrow, in a recession seems odd, especially later in the recession when employment and incomes reached their lows. Yet it seems they do. Thus, regardless of whether government borrowing harms or helps the economy, the effects of government borrowing are dampened, if not largely offset, by private sector responses.